While looking out my window at over a foot of snow this morning, I envisioned a warmer weather landscape. After searching for some dreamy eye-candy, I came upon some of the year’s most impressive landscape design projects — when you could actually see the grass outside. 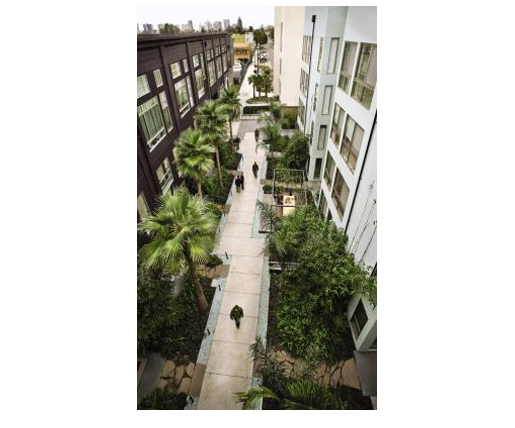 The American Society of Landscape Architects and Garden Design magazine have chosen the best of these lush landscapes for us to admire. Rustic Family Retreat (Saco, Maine) by Richardson & Associates: This conscientous company worked diligently to preserve and enhance the natural surroundings. Oasis of Garden Rooms at Pacific Cannery Lofts (Oakland, California) by Miller Company Landscape Architects (pictured here, photo by Dennis Letbetter): Recycled machine wheels, gears, and engines from the old factory here add much character to the site. Farmstead Reawakening (Pitkin County, Colorado) by Design Workshop: Here, properly-placed poplars, conifers and cottonwoods protect the historic buildings from winter winds. See more of the winning properties at Garden Design Magazine.